An invitation has been issued to sailing superyacht owners to join in the 2012 Audi Hamilton Island Race Week, which will take place from 17 to 25 August. The regatta – which now ranks among the best in the world – and its accompanying programme of shore-based events, takes place on and around Hamilton Island, the centrepiece of Australia's superyacht playground. First staged in 1984, Audi Hamilton Island Race Week attracts around 200 keelboats from across Australia and overseas. The entries range from superyachts and supermaxis through to Grand Prix level racers, cruising yachts, high performance multihulls and sports boats. 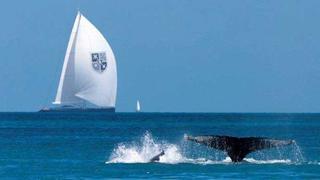 A key element of the 2012 will be the Superyacht Division. Yacht owners and their guests will experience an exceptional racing agenda with stimulating competition over courses around many of the 68 uninhabited Whitsunday Islands that are in close proximity to Hamilton Island. Bob Oatley, who owns the 30 metre supermaxi racer, Sydney-Hobart race record holder Wild Oats XI, bought Hamilton Island in 2003 and together with his family has transformed it into a superyacht destination with a setting, amenities and luxury to rival the best in the Caribbean. Among the island's offerings is a championship standard 18-hole golf course, a yacht club, restaurants, spas, luxury accommodation and the unique qualia resort. Hamilton Island also has its own commercial jet airport.